This custom pool cue cabinet has been handmade to our customers exact specifications and to match pool table fpt654. Any design you have in mind can be created by our highly skilled designers under the supervision of artist H.J. Nick. Pool Stick Cabinet – As shown: Cedar cypress with Walnut stain. 48″ W x 81″ T x 9.5″ D (built to any size). This French Country style gaming cabinet features hand carved Queen Anne curved feet and a decorative French scroll designed top. View our matching Custom Pool Table FPT654. Included in this custom pool stick rack design are spaces for ten pool cues, shelves for two sets of balls, chalk and accessories. Four inset thumb-turn counters are ready for keeping score. 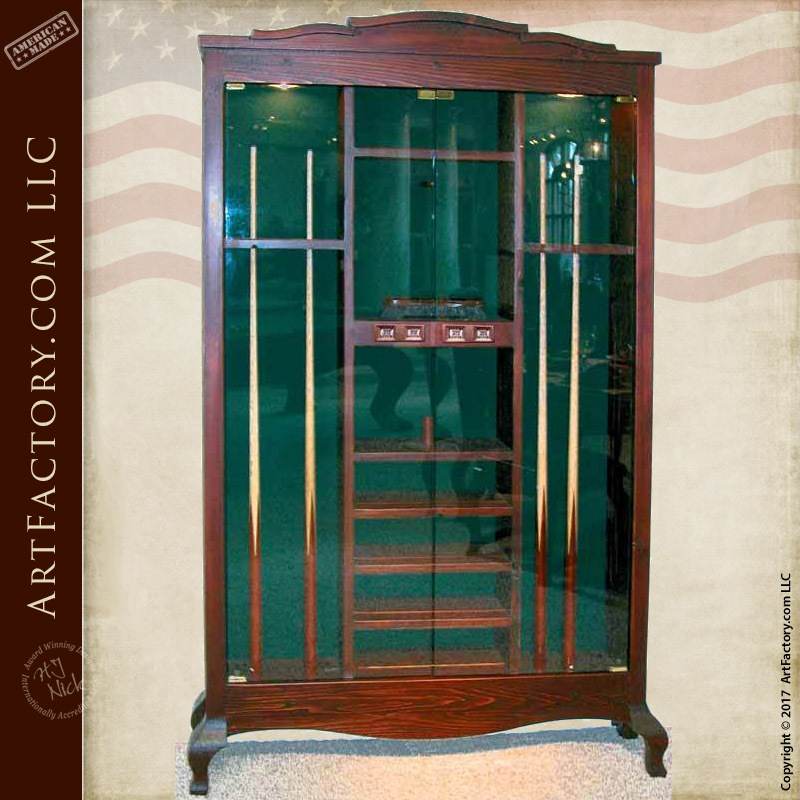 This billiard stick cabinet has 1/4-inch thick glass doors that open outward from the center and can be hand etched with your choice of design. The interior of this pool cue rack is backed with high quality felt (shown in spruce, any color available) and is illuminated by interior lighting. All wiring is UL approved for safety. The finish includes a hand rubbed 10-step process to a fine art shine. Mar proof leveling feet and wall mounting brackets are included for stability. Order your custom pool table in any design and style from ArtFactory.com. ArtFactory.com, an American manufacturer of custom game room furniture, and Designs By H. J. Nick, based in Scottsdale, Arizona have been designing and building some of the world’s finest handcrafted custom furniture for interior designers with ordinary clients as well as more prominent and successful individuals, C.E.O.s, leaders, royalty and celebrities for over a century. Most of our clients want a furnishing that has a BIG WOW factor and elegance. They all want investment value and furnishings that makes a proper statement reflecting their personality or the ambiance of the environment for which it is intended. Please check out our pricing guide. Our prices are usually lower than lesser quality, name brand, mass production, fast process imports, because “We Are The Factory,” creating handcrafted custom furniture in America since 1913.